If you are looking for a book to get you into the Christmas mood, this is without a doubt one of the best! Written by three outstanding authors, Let It Snow is fun, full of cheer, and will be one of those you'll want to visit every Christmas! Plus, it's only $4 , so it won't break the bank. It's Christmas Eve, and one of the biggest storms in memory has hit, isolating tiny Gracetown, Virginia. For Jubilee, Tobin, and Addie the storm will bring them together in the most unconventional of ways. Jubilee, on her way to Florida, is stranded outside of Gracetown when her train gets stuck in the snow. Rather than endure Christmas Eve night on the train with a mass of perky cheerleaders, she ventures out and heads to the nearby Waffle House, where she encounters Stuart, who is still nursing a broken heart. Tobin and his friends JP and the Duke are enjoying their Christmas Eve holed up at Tobin's house and watching a James Bond movie marathon when they are enticed out into the night to the local Waffle House. What should be a twenty minute drive on a clear night turns into a crazy race to get there before the intimidating Reston twins...but when they get there things don’t go quite how they planned. For Addie, the holidays have been filled with misery since she and her boyfriend Jeb broke up. But this year she'll gain some perspective (and possibly more) during one very long and very snowy shift at Starbucks the day after Christmas. All three stories are cleverly woven together, along with each author's inimitable style and brand of humor. 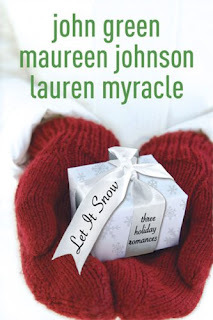 The wholly unique, ironic, witty, intelligent, and heartfelt plots that Myracle, Johnson, and Green have become well known for is strongly present in Let It Snow. The varying and colorful characters are authentic and highly realistic, allowing for the book to appeal to a wide range of reader interests, and even though each author's writing style varies, the book feels quite cohesive. The dialogue, the jokes, the slang, and actions are all pitch perfect to this generation, and wildly appealing, even as they push the limits of reality. But even so, most readers will be more than willing to hold on tight and enjoy the ride as this sweet and sarcastically funny holiday read unravels. Enjoy, and go forth and spread the Christmas cheer! I'm glad to hear this one was good! It certainly has three awesome authors. I will definitely have to read this ASAP! This is my favorite warm fuzzy holiday romance book-it's just so good!